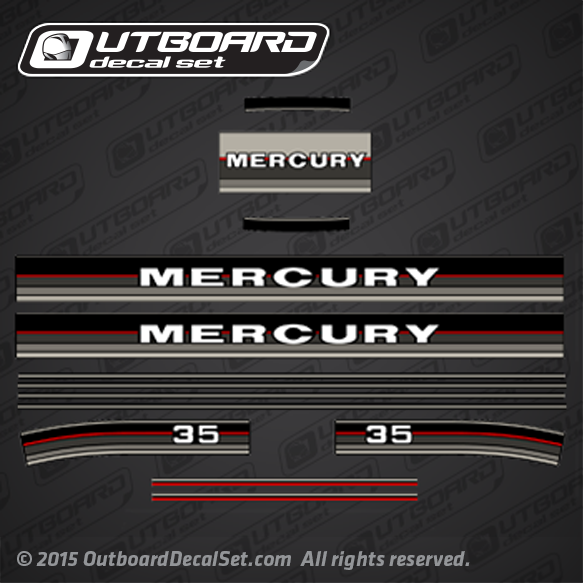 Mercury 35 hp decal set for 1986, 1987 and 1988 Outboard motors. 1986 1988 MERCURY 35 hp M: 1035204 M, 1035205 M, 1035206 M.
1986 1988 MERCURY 35 hp MLH: 1035225 MLH. 1986 1988 MERCURY 35 hp ML: 1035226 ML, 1035224 ML. 1986 1988 MERCURY 35 hp E: 1035504 E, 1035505 E.
1986 1988 MERCURY 35 hp EL: 1035524 EL, 1035525 EL. 1986 1988 MERCURY 35 hp EH: 1035534 EH. 1986 1988 MERCURY 35 hp ELH: 1035554 ELH, 1035555 ELH. 1986 1988 MERCURY 35 hp ELPT: 1035625 ELPT. 1986 1988 MERCURY 35 hp EO: 1035706 EO. 1986 1988 MERCURY 35 hp ELO: 1035716 ELO. 1986 1988 MERCURY 35 hp ELPTO: 1035726 ELPTO.